The wait and expectation are over. The eagerly awaited longest total solar eclipse in many parts of northern India that started at dawn was witnessed by millions of people live and many more millions on the screens of television. Various news channels, including the foreign ones, telecast live the solar eclipse covering China and different cities of northern India. It was indeed an experience of a life time. The next total solar eclipse in these areas will be witnessed in the year 2132. 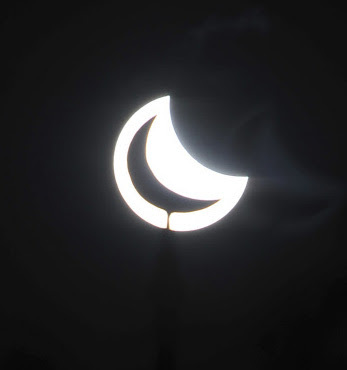 Surat in Gujarat was the first India city to witness this total solar eclipse. However, clouds on the horizon marred the clear view. 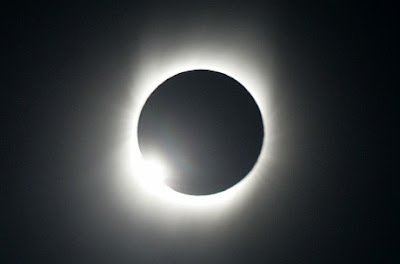 The village of Taregna near Patna in Bihar, which was hyped as the best place to view the solar eclipse could not live up to its reputation as the people gathered there, over 50,000, were disappointed as the clouds robbed them of the celestial spectacle. 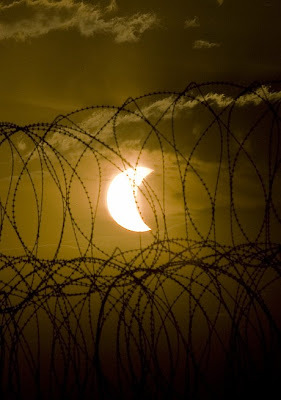 The solar eclipse as seen through a razor wire fence on Combat Operation Outpost McClain in Logar Province in Afghanistan. 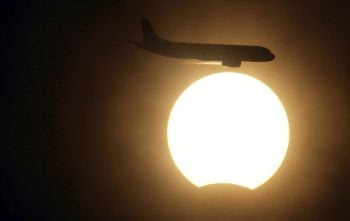 The solar eclipse as witnessed on New Delhi skies. However, thousands of people gathered in the holy city of Varanasi in Uttar Pradesh were lucky to witness the total solar eclipse as the sky was clear. It was a full three minute long total eclipse that converted the dawn into pitch dark for a brief period of time and it is said that the people could see few stars as well. The people could witness the corona of the sun and the golden ring as well. Partial solar eclipse was witnessed in many cities of northern India such as Guwahati in Assam, Delhi, Agra and Kurukshetra where lacs of people took a holy dip. Though the total solar eclipse is a brief occurrence, astronomers, scientists and common people make it a point to witness it as such celestial phenomenon is an experience of a life time. 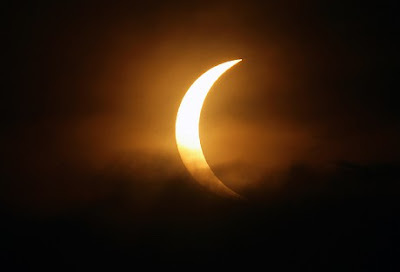 While astronomers and scientists use this occasion to gather additional knowledge about various aspects related with the eclipse, the common people, many of whom ascribe religious significance to such happenings undertake fast, take a dip in holy rivers and ponds and do charity by donating clothes or money to the needy.